I've mentioned before that I'm a huge game lover. I play in my spare time and usually on the weekends in between cleaning the house. One of the places I like to go to get my games has always been Big Fish. I've been a member with them for years. So when I was contacted to review another game of choice I happily said yes. What I like about Big Fish Games is that one, you get to test out your games for an hour before you decide on whether or not you'd like to buy it. This works out great because you can get a lot of playing time in one hour and within that time you can definitely know if you want to keep going or just uninstall the game and call it quits. What I also love about Big Fish is that when you purchase a game it's there forever no matter if something happens to your computer or if you want to remove the game after playing it to free up some space. I've done this a couple of times. And no matter what computer or laptop I'm on if I uninstall a game after finishing it, if I want to come back to it a couple of months later it will be in under "My Games," when I log back in to Big Fish. The game I chose to play was Nancy Drew's Secrets Can Kill, which was a perfect choice since Halloween is right around the corner. Jake Rogers was murdered and his killer is on the loose. A secret died with him that night, and you, as Nancy Drew, must read between the lines to expose the culprit! 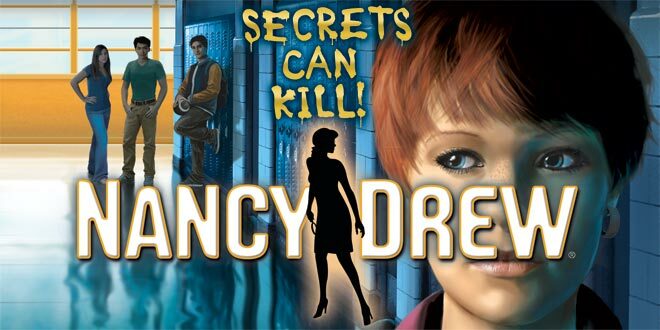 Help Nancy go undercover at a high school to solve the mysterious killing and keep the murderer from claiming his next victim in Nancy Drew: Secrets Can Kill. Immerse yourself in this Adventure game and solve the case! This game sure did give me the chills at times and was an awesome game. I'm a huge fan of Nancy Drew. I've played a couple of her games before and every time I'm hooked on them. This game was filled with mystery, adventure, lots of puzzles to solve and always had me on my toes until the very end. It's definitely a great game for this time of year and the story line was so detailed and on point. It took me about a week to play this game and it was definitely worth it. Trying to solve a murder isn't easy and I found myself stuck at times, but then would just retract my steps. I love that with the Nancy Drew games you don't have to follow any specific order as far as goals, I mean they're there, but you can decide what you do first. I also like how you can rely on the other characters in the game for help if you need any. If you like mystery and adventure, this is definitely the game for you. You can also check out all the other Nancy Drew games as Big Fish Games has them all! Disclosure: All opinions are my own. I received Nancy Drew: Secrets Can Kill at no cost for the purpose of this review. No compensation was received. Big thanks to the people over at Big fish Games for the giveaway prize!